St. Martin's Griffin, 9781250020413, 336pp. Now, twenty years later, they are married, and Sunny wants, more than anything, to be "normal." She's got the housewife thing down perfectly, but Maxon, a genius engineer, is on a NASA mission to the moon, programming robots for a new colony. Once they were two outcasts who found unlikely love in each other: a wondrous, strange relationship formed from urgent desire for connection. But now they're parents to an autistic son. And Sunny is pregnant again. And her mother is dying in the hospital. Their marriage is on the brink of imploding, and they're at each other's throats with blame and fear. What exactly has gone wrong? Sunny wishes Maxon would turn the rocket around and come straight-the-hell home. A debut of singular power and intelligence, Shine Shine Shine is a unique love story, an adventure between worlds, and a stunning novel of love, death, and what it means to be human. 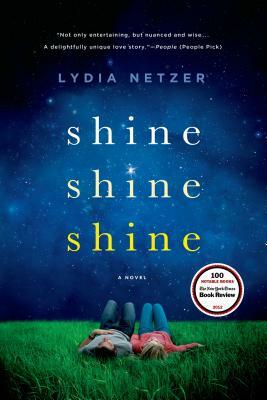 Shine Shine Shine is a New York Times Notable Book of 2012. LYDIA NETZER lives in Virginia with her husband and two redheaded children. She is the author of How to Tell Toledo from the Night Sky and Shine Shine Shine, a NYT Notable Book and a finalist for the LA Times Book Prize. “Creating one of the most compelling protagonists I've read in a long time, Lydia Netzer manages to capture the outsider in each of us. Whether looking at the moon, a child, the suburban landscape, or the face in the mirror, Netzer shows us something we've never seen before, something we thought we knew. A beautifully written story where the exception proves the rule: the things that seem to divide us are, ultimately, the very things that unite us.” —Brunonia Barry, New York Times bestselling author of The Lace Reader and The Map of True Places.